Enjoy the personalised service within the intimacy of your own villa, allowing you to discover what it really means to be in Bali. Our resort is surrounded by traditional Balinese villages, rice fields and forest, offering you an authentic appreciation of Balinese culture, away from the crowds of this iconic holiday destination. Our spacious one bedroom villas offer complete luxury and relaxation, where you can spend your days surrounded by wild and lush tropical gardens. They each have a fully equipped kitchen, private plunge pool and open-air bathroom. Go and Schedule your valentine moment in our Resort! 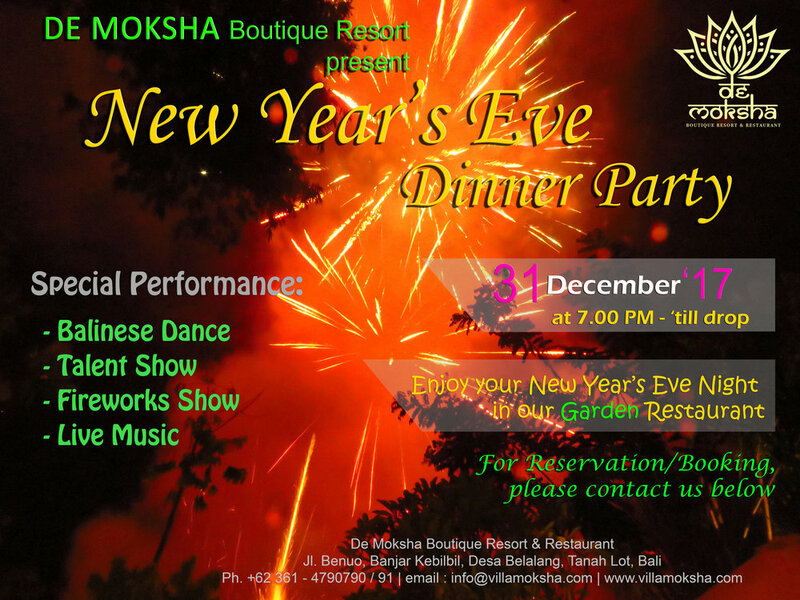 Where : De Moksha Boutique Resort, Jl. Benuo, Banjar Kebilbil, Belalang Village, Tanah Lot, Bali. Package Price : USD 399 (IDR 5,187,000) per couple. USD 42 (IDR 550,000) per pax for Free Flow Mocktail. USD 69 (IDR 900,000) per pax for Free Flow Cocktail. Enjoy the Christmas Night Dinner with us! Watch or participate in a Balinese Dance class, at De Moksha. See how the local villagers practice and perfect their performances and discover it for yourself, you will find that the moves aren't as easy as they look! Enjoy live acoustic music in our Garden Restaurant every Sunday night, with Damian Decibal. Watch or participate in a Balinese Dance class, twice a week at De Moksha. See how the local villagers practice and perfect their performances and discover it for yourself, you will find that the moves aren't as easy as they look! Join us for a movie in our open-air yoga shala. Rp120 000 for the movie, snacks and a small Bintang or juice.